The trishaw. It was once a legitimate form of transportation in Singapore. How much Singapore has changed. You know you’re getting old when you start stories with the year of occurrence and constantly reference back to “my time”. It didn’t help that the trishaw uncle was doing the same. “Where are you from?” the uncle asks as we hop on. 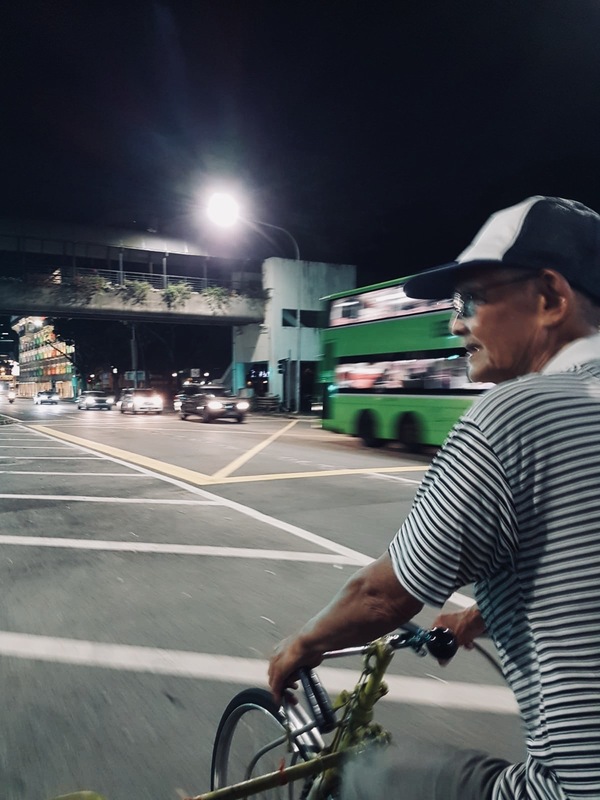 These days the trishaw is no longer the regular mode of transport for Singaporeans. Most of us use the extensive and accessible network of trains and buses. But they’ve kept the old ways alive in tourist haunts to give visitors to my home city a sneak peek into days gone by. “We’re from Singapore,” we tell him. And we are. People should really stop asking me that annoying question just because I don’t speak Singlish and am not from the majority Chinese ethnic group. My family’s roots in this country are so deep and so old that it’s a wonder that I spent most of my life feeling out of place in my little island country. It is only now – after eleven years abroad that I realise how deeply the Singapore Story is embedded inside me. The trishaw uncle unabashedly cycles on the crowded roads now adorned with the best designer cars. Despite the ridiculously high taxes on cars, Germany’s finest automobiles grace the roads in a pompous display of prestige, status and wealth. “They’ll give us way,” the 69 year old uncle says as he pseudo-recklessly takes his chances navigating through the Saturday night traffic without a care in the world. I’m enjoying the simplicity of the moment when a group of boys in the next car wave at us. “Want to join us?” one of them asks cheekily. Well, then… You know the answer to that question. I look around the streets of my home city with a sense of nostalgia that is unbecoming of me. I’m not one that enjoys indulging in the past, but in this moment I can’t help myself. I know this place. Its essence reverberates in my soul as though they were one and the same. Well-maintained colonial buildings from the British era reside alongside tall shiny skyscrapers that stretch out to the sky. The shophouses are still there, retaining whatever is left of Singapore’s old world charm. I, myself, grew up in a shophouse. We ran our business on the ground floor and lived upstairs. I remember it well. How could I forget? “The uncle doesn’t really respond to what we’re saying,” my best friend says. I laugh, relishing every moment. I am all too familiar with men of that generation. They talk and talk and talk. It’s a monologue that goes on and on and on. It’s pointless trying to have a conversation. We young people just have to be quiet and listen. And I do listen. I’ve been listening to my elders my whole life. Their stories are all the same – but still, I enjoy listening to the varied tales of their life experience. They survived wars, curfews, riots, independence and lived through the making of modern Singapore. In that moment I realise that we are all legacies. A living remnant of the places that our ancestors left behind so they could build a new life in another country. This country. This is my country. This is my city. And despite all the countries I’ve lived in and all the places I’ve seen; this is the only place I’d ever call home.